UPDATE: here is the 2017 College Football schedule, for each team in America. 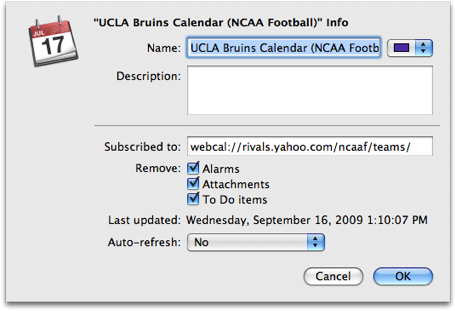 It’s really handy to have the schedules of your favorite teams on your Mac and iPhone. But, it’s no fun at all to have to type them all in. Luckily for us, someone else has already done it, and all you have to do is know where to click. Change the name if you’d like (usually you’ll want to shorten it), change the color if you’d like (I like to match the team color, so purple is wrong in this case), and finally change that “Auto-refresh” to “Every Day.” If you do that, you’ll be up to date if the game time is changed, and you’ll be able to click on past games in your calendar to see the scores. Fun. Go to that page, choose your team, then look for the “Scores & Schedules” link. Click that, and (finally) look for the “iCal” link in the “Add Schedule” section near the top. Note: if you do the work on your Mac you’ll actually take care of your iPhone too (that is, the calendars will just show up), assuming you sync your iPhone with your Mac. You probably do. If it’s not automatic, you need to get the 3.1 iPhone update. Send me a note if you don’t know how to do that. If you ignore my advice to “do it on the Mac” and instead you start with the iPhone, you’ll get the calendars on the iPhone… but they will not automatically show up on the Mac. Start with the Mac. I wouldn’t tell you if it wasn’t for your own good.